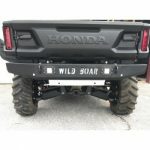 Wild Boar Honda Pioneer 1000 (16-17) Xtreme Rear Bumper w/ LEDS $299.00 FREE SHIPPING! Wild Boar Honda Pioneer 1000 (16-17) Xtreme Rear Bumper w/ LEDS $299.00 FREE SHIPPING! !